GAZA CITY, Jul 7, 2010 (IPS) – At precisely 12 noon on a Thursday afternoon, among the rolling sandy hills in southern Gaza, a controlled explosion destroys another round of white phosphorous shells left in Gaza following the 2008-2009 Israeli war on Gaza. Explosives experts from the Mines Advisory Group (MAG) and the United Nations Mine Action Team (UNMAT) are working together to eliminate the remainders of a deadly Israeli attack. The Israeli bombings from land, sea and air left behind large amounts of unexploded ordnance (UXO) in civilian areas. 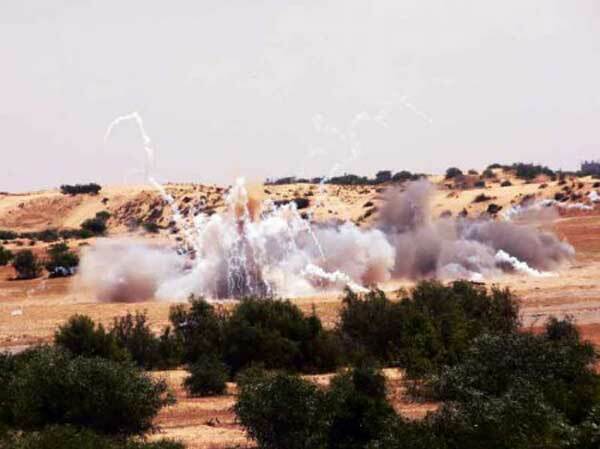 In a precise, technical routine which takes into account all possible dangers to the MAG and UNMAT workers as well as Palestinian residents living in Gaza, the explosives experts are, detonation by detonation ridding Gaza of the remaining white phosphorous shells. In order to deprive them of oxygen, shells are first sealed in plaster casts, then moved into large sand-filled containers, until their day of detonation. Controlled detonations occur twice weekly, coordinated with the Hamas government and the Israeli army, whose war planes fly over the detonation site during the afternoon. On the day of the seventh round of UXOs to be detonated, there are eight shells to destroy. Two are completely full and six are broken open but unexploded. Inside each shell are 122 sponges soaked with the lethal chemical, designed to scatter far upon explosion. The use of sponge-filled white phosphorous shells by Israel’s in its attack on Gaza 18 months back also meant that the probability of injuring civilians was greater. The controlled detonations stop these shells harming civilians in the future and allow the lethal chemical weapon to burn off in containment pits in the ground, far enough away from the nearest houses to cause harm. Twenty minutes after the first detonation, when the majority of the thick, white smoke has burned off and dissipated, MAG technicians prowl for stray sponges, move them to the pit, and re-ignite them together. A solitary clump burns in five to ten minutes, although if covered by sand it can lie dormant for days, re-igniting with the poke of a child’s stick or kick of a shoe. Hill and other medics accompany the team as it slowly safeguards sites where the rubble clearance has finally begun, well over a year after the destruction. With over 4,000 houses completely destroyed and 16,000 houses partially or badly damaged, the risk of UXOs is huge. Buswell says their work is only just beginning. Israel’s 23-day-war on Gaza December-January 2008-2009 killed more than 1,500 Palestinians, and left more than 5,320 wounded. Among the casualties were those hit or affected by white phosphorous bombings. “When white phosphorus lands on skin it burns deeply through muscle and into the bone, continuing to burn until deprived of oxygen,” says Amnesty International. Among Israeli soldiers’ targets were homes, schools where thousands of Palestinians were taking refuge, UN buildings storing humanitarian aid, and hospitals. Over half of Gaza’s 27 hospitals and 44 medical centres were destroyed or damaged. The Al-Quds hospital in Gaza City and the Al-Wafa Rehabilitation Centre east of Sheyjayee — housing over 50 patients, the majority invalid and dependent on life-support machinery — suffered multiple bombings, including direct white phosphorous hits. Israeli officials first denied using white phosphorous but later admitted and justified its use as a smokescreen for soldiers. Over a year after the Israeli war on Gaza, the risk of UXO poses as real a threat as the fresh bombings. These UXOs may detonate even decades later, MAG notes. In rural areas farmers ploughing or workers scavenging stones and steel can inadvertently set the bombs off. The anti-tank mines used by Israeli soldiers to demolish houses, and several of which remain, pose a risk to workers removing rubble or to families returning to their homes to sift for belongings. As of August 2009, the UN reported 12 people killed from UXO explosions, six of who were children. Twenty-three were reported injured, including four children. In March 2010, UNMAT and MAG began to destroy the 343 UXOs collected so far, including white phosphorous shells.